well people, how are yiz. steve here. been reading bits and bobs on here for a while, figure i may as well join, so hi. i'm steve, i have an amazing garden. moved here about 3 years ago and it was an unbelievable mess.. still is really, but getting on top of it slowly. i tend to be more interested in the hardware side of gardening it seems.. everything i've been reading on here has been about strimmers, hedge cutters, greenhouses, rainwater collection systems, pumps... all that stuff. current project.. is a greenhouse. 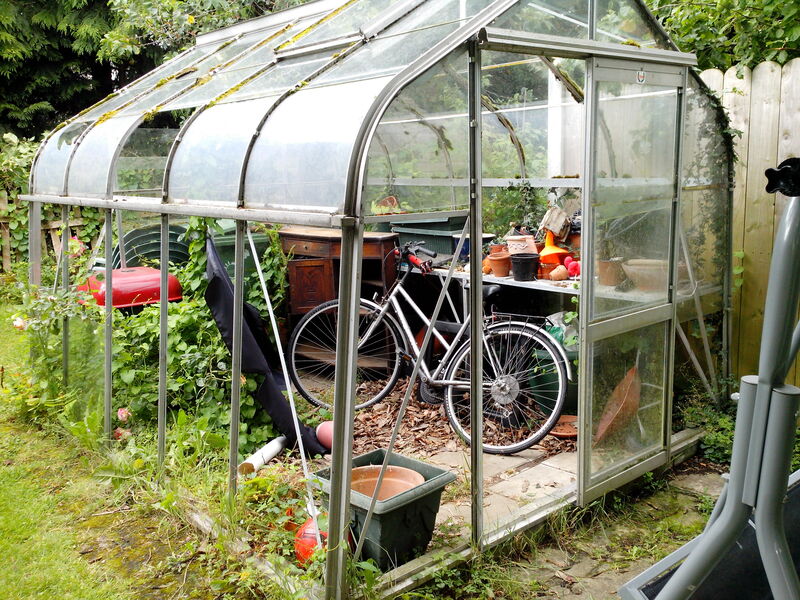 neighbours at my fathers house have so kindly said i can take their old greenhouse.. it's 2.5x3m and needs a clean and a load of glass, but other than that it's great and i'm really into it. it's got a good built in table, and it was installed really well, so i'm going to redo it exactly pretty much with blocks and slabs. 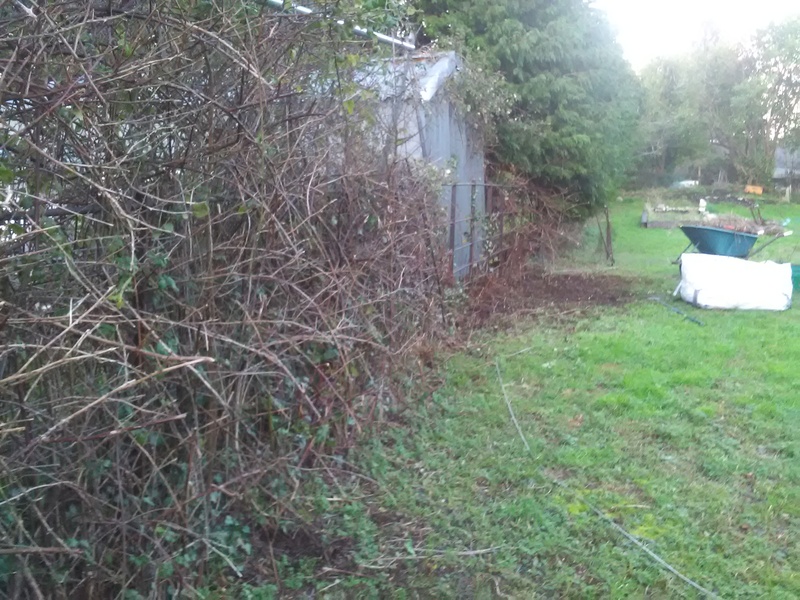 so i'm presently clearing some brambles / trying to dig their roots out, in preparation for buildling the block base for the greenhouse. will post a couple of pics of the scenario. anyway.. nice to meet you all. just thought i'd say hi. greenhouse will go here.. beside the neighbour's shed. and here is the greenhouse as it currently stands. Hello cravings and welcome. I hope you enjoy yourself on here. It sounds like you have quite a project, with that garden - I like your approach - no hurry. The greenhouse looks good - good luck with it. Hi Steve and welcome! Keep sending the photo's. Make sure that greenhouse gets plenty of sun. I built a greenhouse last year, salvaged from an uncared for garden too. In the end it would have been cheaper to buy a new one with all the work I had to put into it. I don't fancy your job of locating curved glass. We built one of those for someone - the curved bit is plastic - well poly'whatsit'. 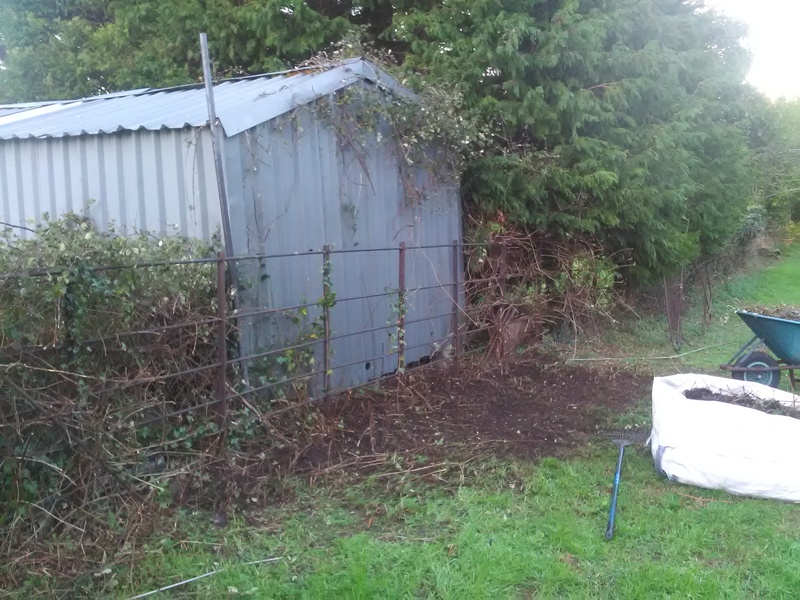 i dithered for quite a while on where to put the greenhouse. further up the garden probably gets slightly more sun in summer, but it's further away from the house, and the garden is very narrow there, so i decided on what you see. i think it will be fine. i'm pretty sure the curved panes are actually plastic. i think there's only one broken.. the back of the greenhouse will be against that shed (pretty much north) so if i can't find one.. i can just put in something else to block the hole and it won't really affect the sunlight at all. first... need to dig out all the roots though. and the rubbish. it's that kind of garden. everywhere you dig or rummage.. you find loads of broken glass, old rotten plastic, car parts... the place is full of junk. but we're getting through it. i'll post more pics for sure as i go. happy days. nice to meet you all, cheers for the welcomes. In the days before refuse collection they threw the rubbish into the wood at the side of our house. Everytime I do any digging there, it is like an archeological dig! I have found some nice little bottles and strangely, kiln 'furniture' - bits of Buller's Rings and cones. kiln 'furniture' - bits of Buller's Rings and cones. You may explain that a bit more. Gobbledegook to me. Cones and Buller's Rings - there's a blast from my past! Ever heard of Googling, Tigxaw? Cones and Buller's rings were placed throughout the kiln or near the window in our test kiln. The Buller's rings would shrink in the firing, the cones keeled. over in the heat. They were used to see if the kiln had reached the required temp. and/or the firing was even top and bottom, front and back. Other kiln furniture was very vitreous material and was used to separate shelves and prop up ware as it fired. One time the thermostat in my college kiln broke and the kiln kept firing. Luckily the Tec man spotted it and turned it off. When I tell you the kiln shelves had warped in the heat and much of our 3rd year exam stuff was in there, you can imagine - it wasn't a pretty site! I could google a lot of things that appear on here bad guy but I don't because I would rather find out from the person who made the comment. If i did then you and I would not be able to converse in the way that we do and you would be much the poorer for it and threads would die very quickly! Sue has done an eloquent job of explaining and now I understand what she was talking about. The only thing that I ever have to google from here is your use of words after you have either devoured a dictionary or watched old episodes of Call my Bluff and come out with something so unheard of that I just have to look it up. Imagine if was talking to you face to face then I would have no chance of understanding you with a) your flowery language and b) your nordie dialect. subtitles please.